Portland city councilors, from left, Spencer Thibodeau, Belinda Ray and Nick Mavodones. 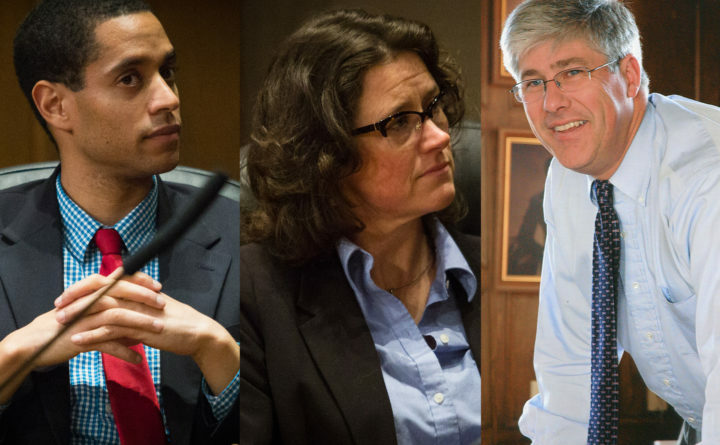 In a night of political change across the state and country, the Portland City Council didn’t. Portland voters re-elected three city councilors Tuesday and approved municipal referendums to join a regional school service center and require more financial disclosure in local campaigns, according to unofficial vote tallies. The nonpartisan local races received relatively little attention this year — amid a divisive national midterm election and a close race to succeed Maine Gov. Paul LePage — and this does not seem to have hurt the incumbents at City Hall. Councilor Nicholas Mavodones narrowly defended his at-large seat from challenger Joey Brunelle by about 700 votes out of more than 29,000 cast. Mavodones won his eighth three-year term with 51.2 percent of the vote. Mavodones, 58, is the longest-serving member of the council and operations manager for Casco Bay Lines. Councilor Spencer Thibodeau won his second term in District 2, defeating first-time candidate Jon Torsch with 67.5 percent of the vote. Thibodeau, 30, is a real estate lawyer and leads the council’s Sustainability & Transportation Committee. In District 1, Councilor Belinda Ray likewise won her second term with 70.4 percent of the vote, defeating Matt Coffey, who was making his third run for the council. Ray, 48, is a freelance writer and editor and leads the council’s Health & Human Services and Public Safety Committee. A ballot measure Ray sponsored also triumphed Tuesday, making hers among the last races to use Portland’s current system of campaign finance disclosures. Portlanders approved local Question 2 with 75.3 percent of the vote, amending the city charter to require local candidates, but not political action committees, to file campaign spending reports 42 days before an election. A similar requirement already exists in state-level races. Portlanders also approved local Question 1 with 64.9 percent percent of the vote, electing to join a regional education center as part of a statewide initiative to centralize some services among different school districts. Local school officials had warned that city schools would lose some state funding if they did not join the Greater Sebago Education Alliance, a move that was also considered by several nearby communities Tuesday. In two uncontested Portland Board of Education races, incumbent at-large member Sarah Thompson and District 1 newcomer Abusana Bondo claimed seats. Current District 1 board member Jenna Vendil did not seek re-election. In the board’s one contested race, in District 2, two allies who had co-founded a grassroots organization to pass a bond funding renovations to four local schools became election season opponents. That $64 million capital improvement bond passed at the polls last November. This year, Protect Our Neighborhood Schools co-founder Emily Figdor garnered 63.9 percent of the votes to defeat fellow co-founder Jeanne Swanton for the seat being vacated by current board member Holly Seeliger.